According to Mashable report, a new web service that called Radar has running “MediaMasher” application recently. 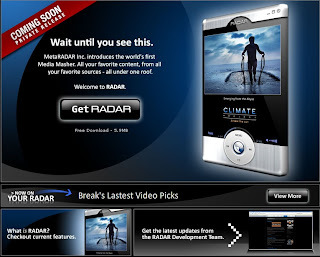 Its website has an introducing about this new service: "Radar is the world’s first MEDIA MASHER, a remarkable new software platform that brings together the best in online navigation and content discovery. Radar bridges the gap between desktop applications, websites and mobile devices to deliver a fresh new user experience unlike anything else". Sounds very interesting, but it is not to public now, so I just know a few features of Radar via Mashable that always introduce some new web stuff. If you want register with it you need submit your email address stand on line, after that you can download a software.